There exists a series of British coins you may have never heard about, most probably have never seen, and almost certainly will never have held in your own hands. They belong to a tradition that dates back over 1,000 years and they are produced for the personal use of the British monarch - these coins are known as The Royal Maundy. For well over six centuries each year on Easter Thursday the reigning King or Queen takes part in a ceremony in which gifts of money are handed out to a number of deserving men and women, equal to the age of the monarch. This means that each year fewer than 200 people receive Maundy coinage. Our own Queen, Her Majesty Queen Elizabeth II does this in person, as did her father King George VI, a practice revived after a period of over 200 years by King George V in 1932. The Royal Maundy service used to take place in London, but early in her reign, The Queen decided that the service should take place at a different cathedral every year. The Queen has distributed Maundy on all but four occasions since coming to the throne in 1952. 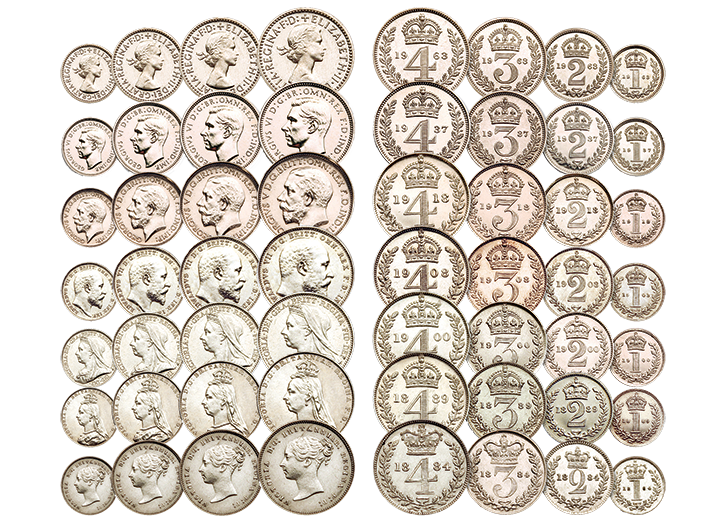 There are many reasons that make the Royal Maundy coinage exceptional in British coinage history. Firstly, no other series of coins has been struck as continuously. The Royal Maundy coins have been struck without missing a single year, since 1822. No other British coin can come close to that length of continuous minting, and it is likely there is no other series of coins in the world that has delivered such continuous service. Secondly, these coins are still being minted to the same size and specification as they have been for hundreds of years. Maundy coins bearing the Queen Elizabeth II image have been struck in Sterling Silver every year since her Coronation in 1953 and uniquely, still bear the ‘young portrait’ effigy designed by Mary Gillick, despite the fact the circulating coinage has featured four portraits in that time. When Britain went ‘decimal’ in 1971 these are the only four coins that did not change size, shape, or design. These coins are exceptionally rare - not just because few recipients of them ever want to part with them - especially as Her Majesty presents each coin in person, but also because fewer than 200 people receive the coins in any one year. The highest mintage of any one set of this type is 1,402 sets. The first set of silver Maundy coins in this collection, bearing the Young Portrait of Her Majesty, can be yours for just £395 - a saving of £100 on the regular price. The remaining six sets of original historic Maundy coins will be sent to you at monthly intervals, entirely on approval and without any obligation for £495 each.